Years ago, the enthusiast crowd and many industry observers were appalled at Porsche’s introduction of the Cayenne. Clearly an effort to build volume and profit for the company, many feared an SUV would destroy the Porsche brand. Obviously, the sole purpose of this video was to establish the Cayenne’s performance credentials and lineage. Porsche successfully expanded volume by introducing a product true to the brand’s core values and marketed it successfully based on those values. In fact you could argue that Porsche is doing exactly the same thing with the Panamera (introducing the “Porsche of four door sedans”). We could debate whether the world needs another high performance sedan given Audi’s S models, BMW’s M series and Mercedes-Benz AMG models, but so far Porsche Panamera sales indicate that from a product point of view, Porsche judged the market well. Porsche has successfully proven that it can expand volume by carefully developing line extensions that reflect the brand’s core value of performance. 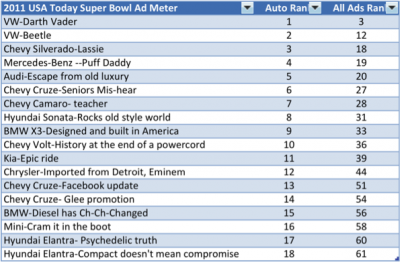 The Super Bowl: The big winner was an ad beauty contest also-ran. 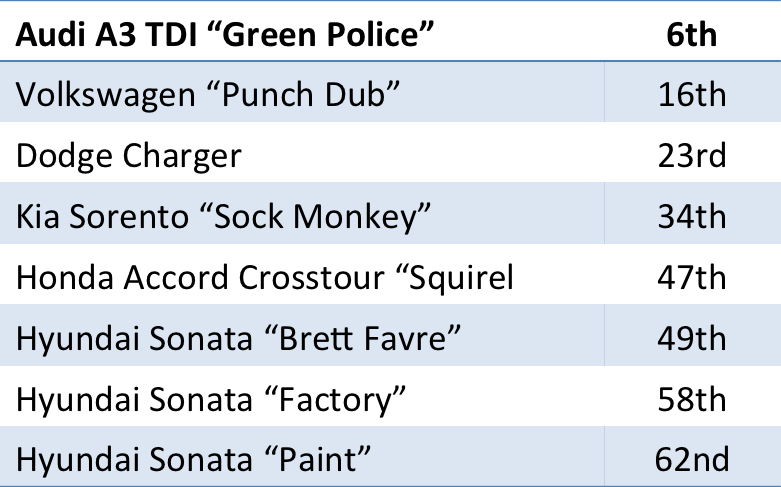 VW followed that up with a second commercial that took the 12th spot (#2 for autos). A pretty good showing for the VW guys and their agency, Deutsch LA. 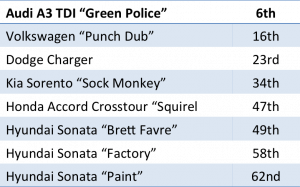 So again, despite having 18 commercials in the big game this year, the auto manufacturers were mostly average at best. Mini even tried puerile humor, which in the Super Bowl is usually a guarantee of good results, but even “Cram it in the boot” didn’t get it done. Another year, another set of mostly average commercials, another disappointing showing in USA TODAY. Except that one auto manufacturer demonstrated that the Super Bowl ad beauty contest truly is just that, a thin veneer that looks great but has little substance.